There’s not too much between these sides, with the most interesting battle likely to be Forsberg vs. Son on the same flank, as both look to be their team’s key attacker. Neither goalkeeper looks to be particularly strong, so perhaps we’ll see some goals here. Berg and Toivonen look to be a strong front two for Sweden, with the former the standout player, but the midfield all look capable of getting on the scoresheet. 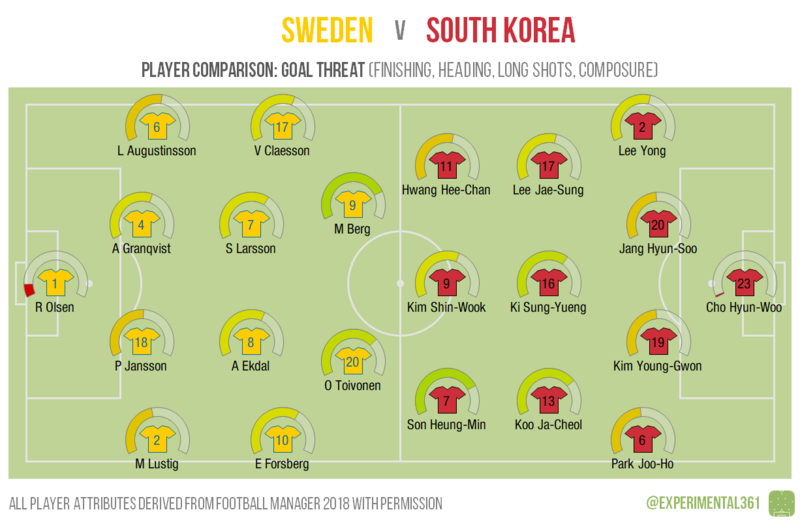 South Korea’s main threat is unsurprisingly Son, with some of the midfielders behind him actually looking more threatening than his fellow forwards. Neither side is particularly blessed with passing acumen in central defence, so expect any balls won by the centre backs to be quickly laid off. Augustinsson at left back for Sweden looks to have excellent delivery, but overall their team looks pretty capable in possession. 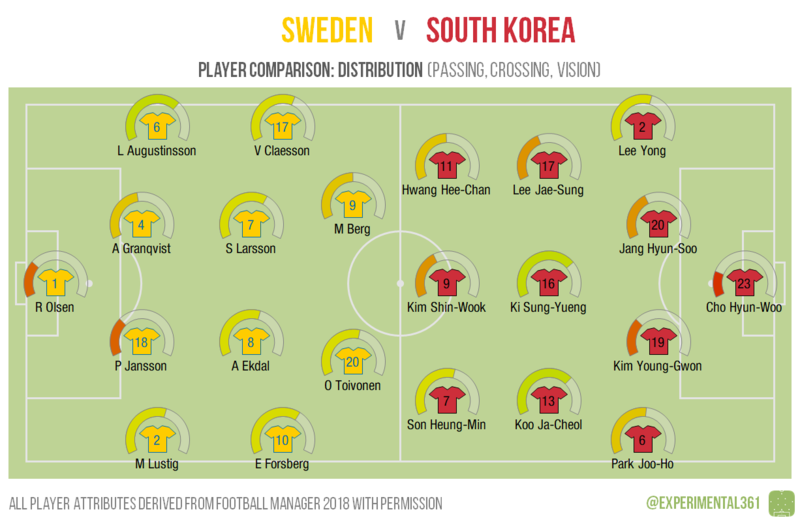 South Korea’s options are a bit more limited – Koo Ja-Cheol and Ki Sung-Yueng are their best passers and could combine well with Son on the left, but on the right they may not get far unless Lee Yong is able to support the attack. 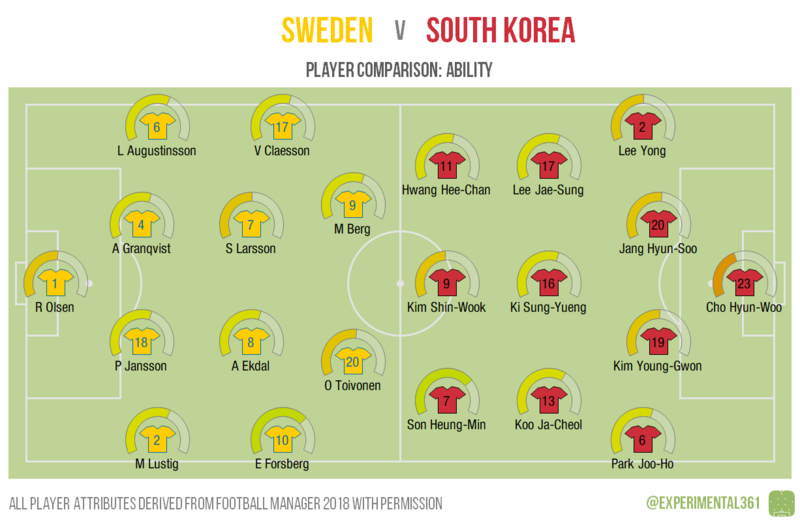 The two teams are pretty evenly-matched here, but the lack of mobility of Sweden’s centre forwards means that they’ll be relying on the wingers to draw players out of position. 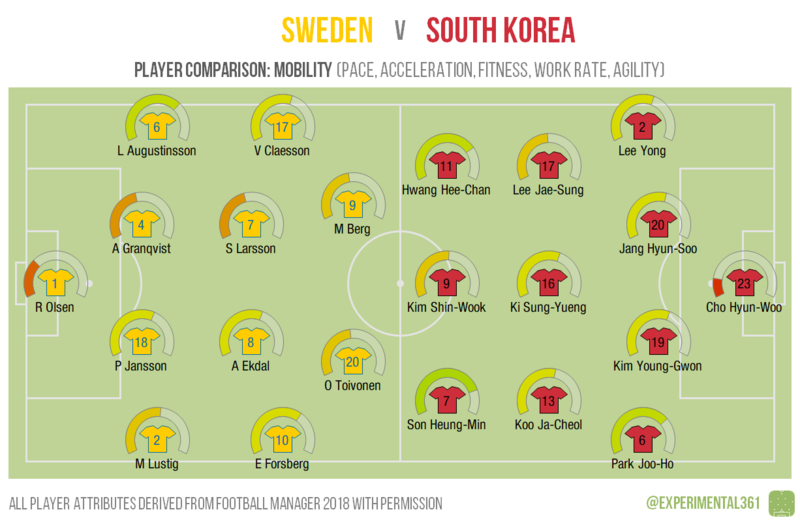 I’d expect to see South Korea’s wide forwards buzzing around a fair bit with the full backs in support – Son and Park could well give the less manoeuvrable Lustig a torrid afternoon if the latter doesn’t get cover from his team-mates.